​Contemporary jazz pianist, keyboardist and composer, Peter Horvath has been perfecting his craft since the age of six when he began taking classical piano lessons. Born in Budapest, Hungary, he attended the Bela Bartok Conservatory of Music. At age 17, he won the National Jazz Combo Competition in Hungary and two years later moved to Austria to attend the Vienna Conservatory of Music. In 1983, Peter moved to the United States, where he studied at the Berklee College of Music in Boston. ​He has since performed, recorded and toured nationally and worldwide with a long line of world-class artist, including jazz greats Bobby Hutcherson,​ Joe Henderson, Richie Cole, Ernie Watts, Eddie Henderson, Charles McPherson, Benny Maupin, the Victor Bailey Group, Lenny White, Arturo Sandoval, Randy Brecker, Marcus Miller, Pee Wee Ellis Funk Assembly, Bob Mintzer, Bob Sheppard, Craig Handy, Tiger Okoshi, Lalah Hathaway, Melba Moore, Ledisi, Keith Washington, Rosie Gaines, Ray Obiedo, Pete Escovedo and the Oakland Symphony. Peter composed for and performed with David Garibaldi for his critically acclaimed Warner Brothers video/CD series and recorded the tracks for Aretha Franklin's performance of the National Anthem at the 1993 World Series. 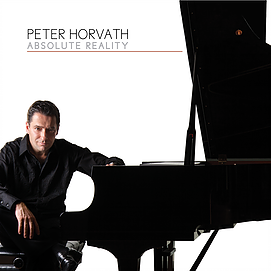 ​​Peter Horvath's first solo recording, "Foreign Matter", has received enormous national contemporary jazz radio airplay. In its first week of release, it was the #1 most added recording to Gavin's Adult Alternative Chart and #2 most added to Radio & Record's NAC Chart. ​His new album, Absolute Reality, is featuring some of the greatest names in jazz, like Bob Mintzer, Randy Brecker, Victor Bailey, Lenny White, Dean Brown, the late Ricky Lawson, Ray Obiedo, Larry Kimpel, Walfredo Reyes,Jr, Karl Perazzo, Peter Michael Escovedo, and others. All original compositions, the music fuses a variety of elements from hard hitting funk jazz with horns, to pieces with latin and straight ahead jazz influences, along with some beautiful mid tempo tunes and ballads, even a solo piano performance to close the album with. The sound represents the musical diversity of the Bay Area along with the influences of years of touring and recording with some of the greats in jazz and beyond. "CTI meets GRP...What a joy to listen to this album...a terrific soloist...a great artist." Contemporary jazz composer and guitarist Obiedo has had an eclectic musical background during his youth spent in the San Francisco Bay Area. The sounds of Miles Davis, Antonio Carlos Jobim, Henry Mancini and the popular sounds of Motown Records influenced his early musical persona. Probably the greatest influence on his embryonic career, however, was the James Brown revue, whose funky, percussive guitar sounds was the platform on which Obiedo built his technique. He joined organist Johnny “Hammond” Smith on a U S tour in 1974, then ECM Records trombonist Julian Priester on his first European outing in 1977. A world tour in 1978-79 with jazz superstar Herbie Hancock is still one Ray’s most treasured musical memories. Ray also started his long association with the great Pete Escovedo which we saw in person at the 2016 SLO Jazz Festival. In the mid 80s his reputation grew as one of California’s finest exponents of jazz, pop and fusion. His other outlet during this time was the pop-rock vehicle Rhythmus 21, wherein he worked with other prominent session musicians from the Bay Area. His own session experience is considerable, having partnered artists including Herbie Hancock, George Duke, Lou Rawls, Grover Washington Jr., Bill Summers, Brenda Russell,The Whispers and most currently Bob Mintzer’s Big Band and Peter Horvath. Obiedo’s solo compositions also attracted acclaim, and saw interpretations from Tower of Power, Sheila E, Marion Meadows, steel pan great Andy Narell, jazz guitarist Bruce Forman and The Pete Escovedo Orchestra. Parts of his work have appeared on film soundtracks, most notably Michael Caine’s “A Shock To The System” and Richard Gere’s “Internal Affairs”. Such notoriety co-existed with Obiedo’s rising status as a solo artist, recording a clutch of 90s albums for Windham Hill Jazz while leading The Ray Obiedo Group on club dates and concerts. Obiedo made his solo debut with 1989’s Perfect Crime, followed two years later by Iguana; with 1993’s Sticks and Stones, he reached the Top Ten on Billboard’s Contemporary Jazz charts. After 1995’s African-influenced Zulaya, he resurfaced two years later with Sweet Summer Days. 1999 saw the release of The Modern World, a hybrid of R&B, pop, and Latin jazz. Never has contemporary jazz guitarist Ray Obiedo’s genuine lifelong affection for the San Francisco Bay Area’s unique musical personality been more clearly evident or remarkably celebrated than in his newest CD “Latin Jazz Project Vol 1 “, released nationwide on the Rhythmus Records label. Photo (above) of Ray Obiedo at 2016 SLO Jazz Festival by John Patrick Images. Peter Michael Escovedo III, Emmy nominated Musical Director / Producer, has earned recognition not only as a percussionist, but a producer, singer, songwriter, and television personality. Peter Michael (named after his father, percussionist and original member of Santana, Pete Escovedo) has contributed in countless world tours, recordings and television productions. ​He has produced television shows, written music for film, theme songs for television, composed, arranged, and produced music for various artists, and is currently releasing a new E. Family cd featuring: Joss Stone, Prince, Earth Wind & Fire, Gloria Estefan, Raphael Saadiq, and Israel Houghton.